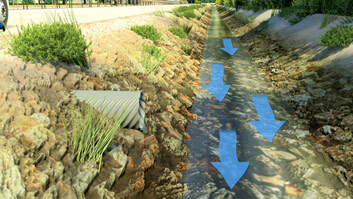 Drains and pumps on secondary containment must be manually operated and normally kept closed. 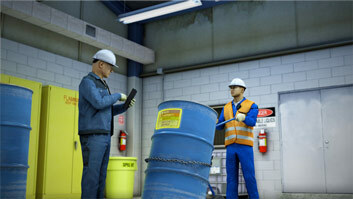 Secondary containment must be "sufficiently impervious" to avoid local contamination. "Passive" containment is deployed before spills, while "active" containment is deployed after spills. At facilities regulated by the SPCC Rule, all containers, equipment, and areas with the potential for oil discharges are subject to secondary containment requirements. Affected equipment and areas must have "appropriate containment" that is able to contain the most likely quantity of oil that would be discharged until it can be cleaned up. The original containers, equipment, and piping serve as the "primary containment," while the "secondary containment" serves as "backup" protection against spills, leaks, and primary containment failures. 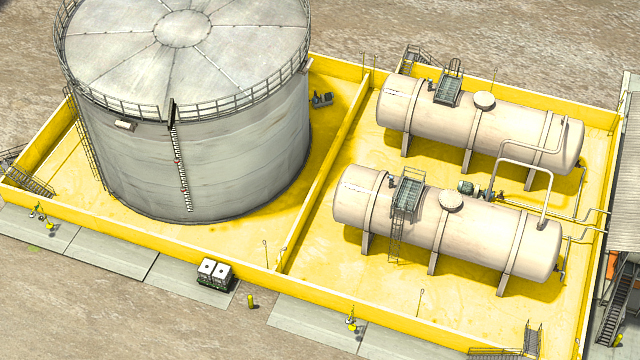 This course describes the secondary containment that can be used to prevent oil discharges. Define the terms "primary containment," "secondary containment," "sufficiently impervious," "vaulted tank," "run-on," and "sufficient freeboard"
List the alternative measures that are required when secondary containment has been deemed "impracticable"
Describe the equipment for which the EPA allows inspections to be replaced with alternative measures without an "impracticability determination"
What is the difference between "primary containment" and "secondary containment"? "Primary containment" includes the containers, equipment, and piping that contain oil products, and "secondary containment" includes the devices and structures that can be used to collect and contain oil discharges until the oil can be cleaned up. What is the difference between "passive" and "active" secondary containment? 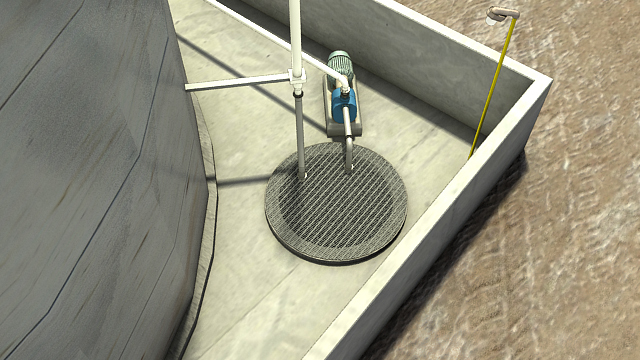 "Passive containment" devices and structures are anticipatory; they are installed before oil discharges occur. "Active containment" devices and strategies are responsive; they are deployed or activated in response to a discharge or prior to an oil-handling activity. 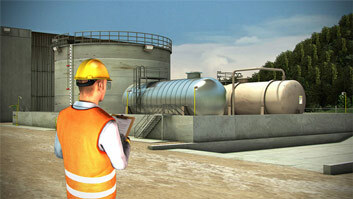 What are the SPCC Rule sizing requirements for secondary containment? The SPCC Rule states that secondary containment must be sized to "contain 10% of the volume of the containers, or the volume of the largest container, whichever is greater." How is precipitation or "run-on" dealt with for secondary containment that is located outside? The SPCC Rule mandates that "sufficient freeboard" be included in secondary containment if it receives run-on. This can be based on local historical precipitation data or be based on the total stored oil volume. What is an "impracticability determination"? 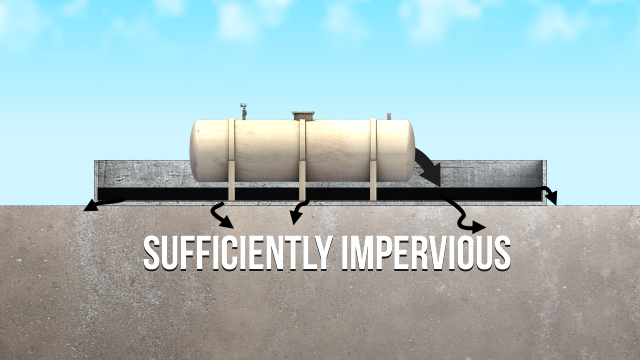 The impracticability determination is used when secondary containment cannot be installed by any reasonable method. Reasons can include space and geographical limitations, local zoning laws, fire codes, and safety considerations, among others. 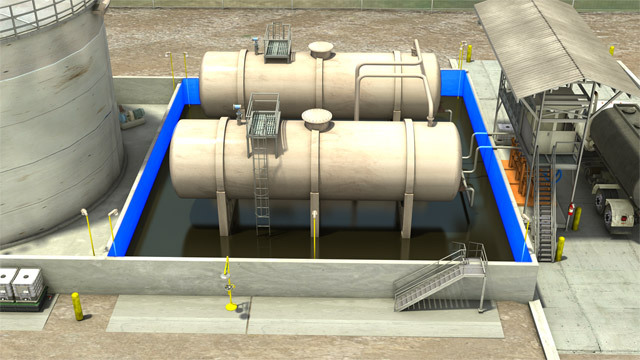 Secondary containment for containers and equipment with the potential for oil discharges, must be sized to handle likely quantities, and typical primary containment failures. 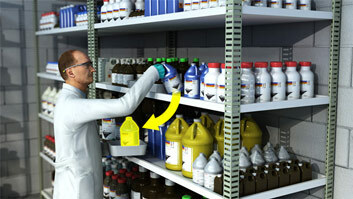 The SPCC Rule states that secondary containment must be sized to "contain 10% of the volume of the containers, or the volume of the largest container, whichever is greater". What exactly does this mean? To help illustrate, let's examine three different scenarios. 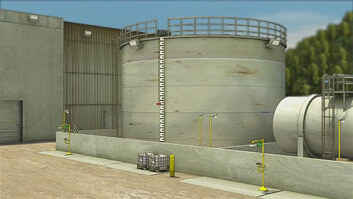 At the first facility, used oil is stored in three 100 gallon tanks in a single containment area. In this case, 10% of the total oil volume is equal to 10% of 300 gallons, or 30 gallons. One hundred percent of the volume of the largest container is equal to 100 gallons. Because 100 gallons is greater than 30 gallons, the secondary containment for this area would need to have a capacity of at least 100 gallons.